As a reminder, this is a study at using high priced QBs in DFS compared to saving with quarterbacks and improving your roster elsewhere. Through the first three weeks, we only had one set of scores where the cheaper quarterback lineup performed better. While it's a small sample so far, the gaps have been pretty wide, and it's pointing to high priced quarterbacks being better. If you want the intro piece as an overall breakdown on the plan for this DFS study, click here. To see the Week 4 results, just keep reading. Team high priced QB went with Aaron Rodgers again, and it's easy to see how one mediocre game can throw off the score quite a bit. Rodgers didn't torch the 49ers and finished with just 16.26. That hurt Randall Cobb too, which is the risk of pairing the top receiver with said quarterback. Julio Jones didn't do much at all, but the Falcons didn't need him after they had won the game in the first quarter already. For the second lineup, Latavius Murray got the boot for Demaryius Thomas at Flex, and A.J. Green replaced Robert Woods, all with Andy Dalton at quarterback. 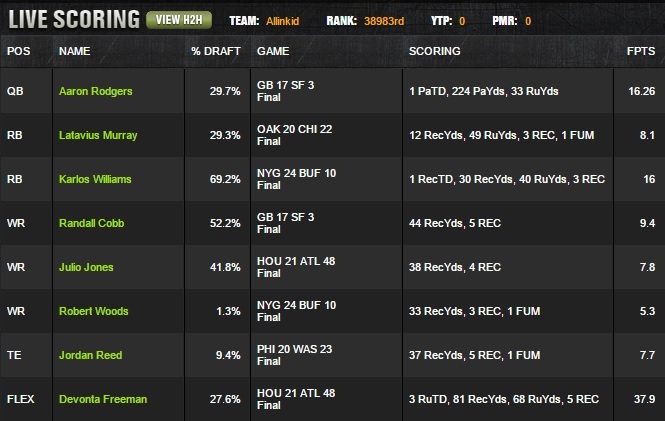 That's the first DraftKings lineup to lose with the high priced quarterback play, and it was a decent gap. It will be interesting to see if this happens a bit more often now that we have better reads on some players. Same thing on FanDuel with the Rodgers-Cobb pairing, but the lineup surrounding them was much prettier. 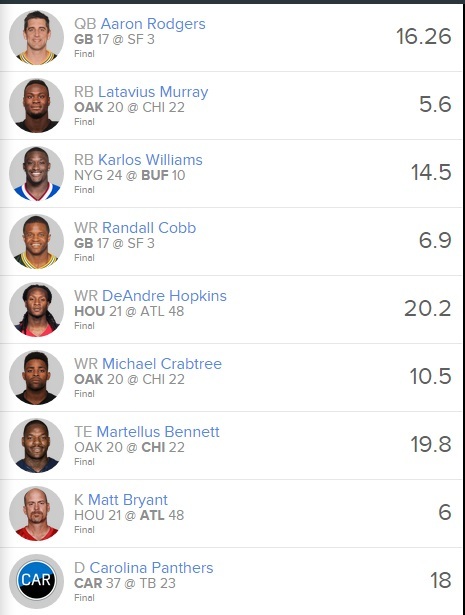 DeAndre Hopkins, Michael Crabtree and Martellus Bennett had good games, and Karlos Williams' score was stronger compared to other options on FanDuel. However, the savings didn't do as much as DraftKings with Dalton barely topping Rodgers. Plus, I bumped Karlos Williams for Joseph Randle. Even with Michael Crabtree tagging out for teammate Amari Cooper, we still netted just 3.48 points. If Williams had remained, it would have increased to 9.38. Not huge, but better… and also proof that more expensive doesn't automatically mean better scoring. Week 4 narrowed the gap, as now DraftKings is averaging just 13.45 more points and FanDuel a measly 3.52. As mentioned, it was the first "win" for team mid-tier QBs, but that's now two times for FanDuel. That is an interesting facet too… maybe FanDuel is a better site than DraftKings for lower priced QBs. We'll continue to study it.